SENSORS - ROBOT ENCODER (SLOT, ROTARY, LINEAR) The Robot Encoder - What is it? The encoder is a sensor attached to a rotating object (such as a wheel or motor) to measure rotation. By measuring rotation your robot can do things such as determine displacement, velocity, acceleration, or the angle of a rotating sensor. A typical encoder uses optical sensor(s), a moving mechanical component, and a special reflector to provide a series of electrical pulses to your microcontroller. These pulses can be used as part of a PID feedback control system to determine translation distance, rotational velocity, and/or angle of a moving robot or robot part. For instance, if you have a wheel rotating, and you want to measure the time it takes to rotate exactly 40 degrees, or know when you have traveled X distance, you would use an encoder. The sensor would be fixed on your robot, and the mechanical part (the encoder wheel) would rotate with the wheel. The output of an encoder would be a square wave, so if you hook up this signal to a digital counter or microcontroller you can then count the pulses. Knowing the distance/angle between each pulse, and the time from start to finish, you can easily determine position or angle or velocity or whatever. Encoders are necessary for making robot arms, and very useful for acceleration control of heavier robots. They are also commonly used for maze navigation. Calculating Robot Motion with an Encoder For every pulse sent out by the encoder, your rotating wheel has traveled a certain angle. So how do you calculate the distance a robot traveled for each click the encoder recieved? If the encoder gives 5 clicks in one second, how fast is your robot going? To do this calculation you need more information, such as wheel diameter andencoder resolution (number of clicks per 360 degrees, or counts per revolution). I highly recommend reading the first half of my Robot Dynamics tutorial before continuing on to understand how wheel diameter relates to robot speed. Starting off, you should know two things - wheel circumference and counts per revolution. Dividing the two, you can easily figure out the distance your robot travels between each encoder click: wheel circumference / counts per revolution = distance traveled per encoder count Now velocity is just distance divided by time . . . So using the answer in the above equation, divide that by the time passed determined from your microcontroller timer: distance traveled per encoder count / time = velocity After you know distance and velocity, you must then run a PID feedback control algorithm so that your robot can match a desired (pre-determined) distance and velocity. To better help you, check out theencoder calculator to aid you with your robot specs. Typical Problems With Encoders There are several problems with using encoders for robot position control. First, just because your wheel rotates does not mean your robot is moving. Ever driven a car in snow? Error can quickly build up. This is why it is not recommended to use encoders for position feedback of your robot (such as in mazes). Second, encoders have a finite accuracy. Suppose your encoder has a 360 count resolution. That means your accuracy will be off by up to an entire +/- degree. You may think, 'hey, 1 degree is really good.' Wrong. Innaccuracy multiplies over distance. If the pilgrims were off by a single degree, Thanksgiving dinner would consist of aligator from Florida. If you have a robot arm that is 3 feet long, with several joints each with encoders, one degree could mean inches of inaccuracy. Other Tips and Uses There are several things you need to watch out for when designing encoders. First, keep ambient light out of your sensor, such as sunlight. If light shines in to your sensor, it could potentially read false clicks. Be careful when putting a control system on motors, as an improper one can damage the motor and circuitry by sudden voltage changes. I once fried a motor because of this . . . High resolution encoders for velocity control can take a lot of computational system time, so it is better to use a digital counter IC to count encoder clicks than to have your microcontroller count clicks. Your controller can read the counter value serially when it pleases instead. 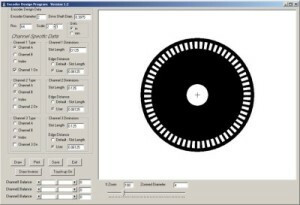 On your encoder wheel, you can try coloring your black lines in different shades of grey so that your encoder can identify which angle it is at even after a reset. Your robot would match the shade with the angle. Just be careful that the sensor does not read a 'grey shade' when exactly between a black and white line. 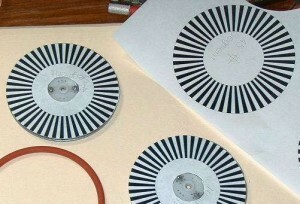 When making an encoder wheel, I found that Titanium White paint reflects/blocks infrared very well. Many types of printer ink does not! Encoder Costs So all that being said, there are two ways to get an encoder. You can spend $50+ on a high resolution encoder. If your robot has several wheels or joints, you could end up spending $200+. For high resolution high accuracy requirements, this is the way to go. A robot arm with several joints will require a higher accuracy encoder, for example. You should consider looking at a few online (they are listed in the ads block on the right side of this page) to see what is available. Or if you do not mind inaccuracy (or can't afford high accuracy) you can make your own, of your design, for less than $2. All you need is an IR circuit and an encoder wheel attached to your wheel or rotating/translating joint. This is how I typically wire up my encoder sensor. Basically a PCB with the circuit and slot encoder attached, and wiring to go straight to my microcontroller: And a closeup of the connection: Encoders With a Microcontroller It is highly recommended to read the tutorial on programming timers and PID control. How to Make an Encoder Wheel 1) Download the basic excel pie chart encoder or make your own. 2) Modify it to get the desired resolution (add more 1's and 0's). 3) Move the pie chart as an image to paint, and color each as black and white. 4) Print it out on transparencies, and cut it out. 5) Make sure you cut the hole in the center perfectly or you will have problems later of wobbling. 6) Trace over the black with several layers of infrared absorbing ink, akapermanent marker. 7) Place the encoder wheel on your rotating shaft, and use a slot IR sensor to count wheel rotation. 8) Make sure the resistor value on your IR sensor circuit is chosen right to work with the permanent marker ink. These are a few encoder wheel designs I printed out to try: I have also found a really neat encoder design program written by this guy namedScott Boskovich. It is way better than the excel method. Give it a try! If you expect a motor rotation to often go to a certain angle, you can also put interesting patterns on your encoder wheel to make processing simpler. You can use an IR LED array IC to read all the patterns simultaneously.